This project explores how Hulu could benefit from adding social features, like Profiles and Watch Parties, to its platform. My teammate and I were surprised to find that many of the popular streaming apps, like HBO and Netflix, don't offer social features to its users. Mutual fans of TV shows and movies don't have a place on the website to discuss their fan theories, favorite moments, characters and more. Intrigued by this, we decided to come up with a set of features that would allow Hulu users to engage with each other over the content they love using the Living Room app. With Profiles, users can search and find people to connect with on the app. People can share what they are watching and create curated playlists of content. We also created a “Watch Parties” feature for friends to stream content together in real-time while in different physical locations. At the end of the hackathon, my teammate and I presented our ideas to the UX Design team, including the VP of UX Design and VP of Experience. Whether you think about it or not, watching television is very much a social experience. When you tune in to watch the latest episode of Game of Thrones on Sunday night, you are not alone. Your friends and coworkers are watching too. They might not be in the room physically with you but they’re there with you every step of the way. You’re connected to your friends via Snapchat, Instagram, Messenger, and more. When the credits roll, you might go on Twitter or Reddit to see what strangers have to say about the cliffhanger season finale. On Monday morning, you’ll have a conversation with your coworkers and buddies about what happened in the show just to relive the experience one more time. Hulu’s mission statement is to captivate and connect people with stories they love by creating amazing experiences. The people behind Hulu believe that TV is something people can bond over — and it’s true. When I met my roommates for the first time this summer, we didn’t have a lot to talk about at first. Our conversations picked up in a short amount of time when we realized that we liked the same TV shows. We made plans to watch our favorite shows together over the summer. Some of our best memories were created thanks to TV. Hulu does a great job captivating its audience with memorable content but could do a much better job at connecting viewers across the platform. We noticed that almost all of the streaming apps, like Hulu and Netflix, don’t provide users with any social capabilities. There's no way for friends and fans to interact with each other over the content they're watching. We started the hackathon researching what social features exist on platforms like Instagram, SoundCloud and Spotify. Together, we did a mind mapping exercise to derive a holistic view of the Hulu platform and TV watching experience. From doing this exercise, we learned that TV watching is inherently a social experience crafted by communities, as mentioned earlier. We started studying the different ways that people talk about the content they watch, both online and offline. From sending Snapchats of episodes to reading about fan theories on Reddit, people like to participate and show appreciation for the TV they watch in different ways. Following our affinity map, we looked for inspiration in terms of content engagement from other social media sites. We quickly drew up various social media UX based on our own usage. Our goal was to think about all the different ways in how users experience content socially. This exercise actually help pushed our design further because we were able to look beyond just thinking about TV. For example, we noticed how people love to put TV premiers on their Snapchat story. Our assumption is that they are creating a micro-community within stories themselves. Another interesting example was Spotify “Friend Activity” and how people can actively engage with music content directly when their friends are watching it. This led us to think about profiles. Profiles create the foundation for developing an online identity and community. 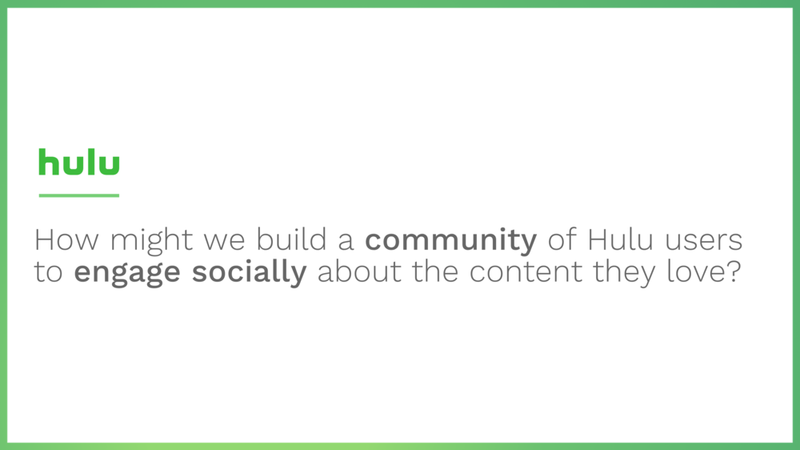 It lets people have a sense of belonging within a larger community and to think about social aspects within the Hulu platform. We came up with another idea known as “Watch Parties,” a feature that allows users to watch shows and movies with friends in real time from different locations. From any TV show, users could set up a watch party and invite their friends, similar to sending out a party invite. Before moving forward with any more ideas, we had to first figure out how “Friends” would work on Hulu. What's the function of friends on Profiles? What value does it bring? How do people connect to friends on the platform? We spent a while debating how to design the Watch Party invite flow. These features help bring about a sense of personal identity and community within the larger ecosystem. Friends can follow other friends and strangers to see what they’re watching in real time, the way Spotify lets you see what friends are listening to. With friends on Hulu, you could get recommendations for what to watch next from your trusted friends who are the best sources. In addition, you could leverage these profiles to create viewing parties, a feature that allows Hulu users to watch content they love with their friends in real time. In these viewing parties, friends would be able to gasp, shriek, cry, and laugh at the same moments.